Each Hawaii island is wonderfully diverse, and the same can be said for the state’s flowers. From the state flower of the hibiscus to the sweetly scented plumeria, these are some of Hawaii’s most beautiful flowers, along with the symbolic meanings behind them. The hibiscus was first adopted by Hawaiians as their Territorial flower in the 1920’s, and, in 1988, Hawaii’s legislature legally stated that the yellow hibiscus was now the official flower of the state. While only five hibiscus species are actually native to Hawaii, other varieties were brought in over the years and hybrids that were unique to the islands were soon created. In general, the hibiscus signifies beauty, but the way in which they are worn can allude to different meanings. When worn behind the left ear, the hibiscus shows that the woman wearing it is married, while if it is worn behind the left ear, then that is a sign that the woman is single. Signifying royalty, the crown flower resembles a crown when the petals of the blossoms are rolled back, which is what gave the flower its name. The flower was also a favorite of the last queen of Hawaii, Queen Liliuokalani. The spiraled red ginger plant boasts vibrant red spiky blossoms, similar to that of a pineapple’s pointed foliage. The meanings behind the flower focus on wealth and diversity, which is why they are often used in flower arrangements intended for gifts, as well as window displays in homes around the state. The sweetly-scented plumeria has a number of positive meanings, from birth and love to perfection and new beginnings. Since they are so fragrant, only royalty used to be allowed to wear them, but they are now cultivated in abundance in Hawaii and are commonly used in leis. There are four varieties of orchid that are native to Hawaii, and these grow so abundantly here that Big Island, with its many orchid farms, is often nicknamed Orchid Isle. The blooms cultivated here are mostly for export, but the orchid is widely loved across the state. These bright flowers are often given as a 14th wedding anniversary present, and, in ancient Greece, signified virility. Today in Hawaii, the orchid symbolizes luxury and the refinement of beauty, which is not a surprise when you take a close look at just how exquisite these flowers are. The Queen Emma lily is another flower that is associated with Hawaiian royalty, as it was a favorite of Queen Emma, the wife of King Kamehameha IV. While the flower may be native to the Seychelles and Mauritius, it is grown quite widely across the Hawaiian islands for its elegant beauty. Hawaii is packed with stunning blooms, with different varieties of flowers blossoming at different points throughout the year, ensuring that the islands are always filled with bursts of color. Flowers have always been a huge part of life on the Hawaiian islands, and this is a part of their culture that the locals will never let go of. We all know the name Christian Dior, but not many fully appreciate the major influence that this individual has had over the entire fashion industry. Born in 1905 in Granville, a seaside town on the coast of Normandy, Dior was always passionate about art, and, after he had to close the art gallery he owned, Dior began selling sketches to haute couture houses, soon landing himself a job as an assistant couturier. This was interrupted in 1939 when World War II began, but Dior continued developing his skills, creating dresses for the wives of the German and French soldiers. Once the war was over, new opportunities for businesses, including fashion, started to arise, and this is when Dior’s influential ideas and designs started to take the world by storm. Once the war ended, Dior strongly believed that the public was ready for a new style, and, in his first couture fashion show in 1947, the New Look was born. Dior delivered excitement at a time when the French couture trade was faltering, giving the public a look that was reminiscent of the Belle Epoque ideal. With long, full flowing skirts, tiny waists, soft shoulders and luxurious fabrics, the New Look was a huge success. Dior’s subsequent collections after the New Look were developments of the original style, with the collections named after the silhouettes that the garments had. From the A-Line to the Zig Zag Line to the Arrow Line, all of Dior’s collections were created with the finest tailoring and the most luxurious fabrics. Each collection consisted of around 200 pieces, with new collections contradicting many elements of past collections, bringing a rate of change to the fashion industry that had not been experienced before. Dior himself would release style statements along with each collection, informing the public that there was to be “no yellow” that season, or “no hats with clean and tailored style”. The press would pick up on this and repeat it to the wider public, giving the industry a force that it had not seen before. Being one of the most highly respected couture houses in Paris, Dior had his pick when it came to talented assistants, and it was some of these lucky few that were able to learn from the master, and go on to become significant fashion influencers themselves. Pierre Cardin was one of these, as was Yves St-Laurent, who contributed a number of outfits to Dior’s collections. Sadly, in 1957 at the age of 52, Dior died after suffering from his third heart attack. At the time, his fashion house was bringing in over $20 million a year, and his financier decided to appoint Yves St-Laurent as artistic director, allowing the label to survive its founder. To this day, Christian Dior is still one of the most well respected, as well as famous, designers in the world, and the brand continues to produce designs that are synonymous with Christian Dior’s original standards of taste, elegance and luxury. Everyone who is anyone has a fragrance line with their name on it. Celebrities like Beyonce, Justin Beiber, Lady Gaga and Taylor Swift all have their own line of fragrances. Despite the charms of smelling like their favorite stars, everyone doesn’t like the idea. This is where customized perfumes become so important. People are getting more and more attracted towards customization because they simply don’t want to smell like someone else. People are always looking forward to smell unique, have a signature fragrance and smell like themselves. In this article, OROGOLD helps you understand how to develop a signature fragrance. One of the first things that you need to do before shopping for your own fragrance is to learn the art of fragrance making and understand what it takes to develop your signature scent. You don’t want to develop something that is too strong and leaves you with unwanted headaches. You want to explore all sorts of aromas to find something that suits your personality the best before you start mixing and matching them. Roses might be the most popular floral fragrance, but there is a lot more to floral scents. You might not like a particular floral smell, but another one might just end up captivating you. This is why educating yourself about the world of fragrances is so important before you go about building your signature fragrance. Understanding your own personality can work wonders in choosing a scent that really works for you. You have all sorts of scents to choose from – things like woody scents, fresh scents, spicy oriental scents and floral scents can work wonders for you. You can also visit popular perfume stores and take whiffs of different scents which fall under different categories to find one that suits you the best. Any signature fragrance should have three notes – a top, a base and the middle. The top note is the first impression that you want to leave. It should be invigorating and refreshing. It should be something that really makes your day when you wake up and invigorates you for the journey ahead. The base is the longest lasting part of your fragrance. It is what you’re finally left with after the top and middle notes evaporate. You could look at soothing smells like creamy vanilla or choose sensual smells like earthy, green or musk. The middle note is what you’re left with about 30 minutes after applying the fragrance. The middle note should always be a scent that helps you to settle into the day. Things like spice and soft florals are perfect ideas for the middle note. Once you evaluate the various notes and shortlist your favored smells, it’s time to experiment with different smells to create your signature fragrance. Experimenting with your signature fragrance can be a lot of fun. You need to blend various essential oils and try to determine which smells blend well with each other. You can find these oils in any specialty perfume store. A number of online sites also offer different quality oils so you can pick and choose things that are perfect for your own needs. Essential oils are made using natural ingredients like herbs, fruits and flowers and they tend to be more expensive than those fragrance oils. Essential oils don’t contain any synthetic materials that can damage your skin either. If you have sensitive skin, you should always look at adding a few drops of almond oil or baby oil in your blends. Once you combine the right essential oils, you need to add pharmaceutical-grade alcohol into your blend before you can bottle it for spritzing. The more alcohol you add into the blend, the more the fragrance dilutes. Make sure that you never use rubbing alcohol. With a little bit of research, you can actually find the right alcohol at a place near you. It is always advisable to use a dropper while adding alcohol because it becomes easier to mix the right quantities and things are less messy as well. Most people end up going wrong when it comes to wearing the scent. For maximum effect, you need to wear the scent on your pressure points. This means that you need to apply it on the nape of your neck, your cleavage, the insides of your thighs, behind the knees and on your ankles. As the pulse points start warming up, the fragrance rises. The secret to making your fragrance last throughout the day is to apply it on the right places. Never spritz the fragrance in the air and walk through the perfume cloud because this really doesn’t work and it also leads to a lot of wastage. When we think of beauty we don’t typically think of gadgets – but that’s all about to change! OROGOLD would love to get you intrigued by introducing you to a few of the hottest beauty gadgets that you can get your pretty little hands on right now. Some are simple, while others are a bit far out. Either way, we know you will love them – so, you’re welcome! The Q-Redew is an innovative, amazing just plain fantastic tool for any curly-haired girl. A must have to keep in your bathroom or even in your car, this spiffy little gadget will transform the way you feel about your curly locks in a snap. The Q-Redew allows you to fix and touch up your curls when you are pressed for time or on the run. You can style and refresh your style all with one tool! The best part? Even girls with straight, thin hair can use it and it will give them waves to be envied. On the lower end of the price spectrum, this gadget sells for about $70.00. Goodbye, crow’s feet, and hello youthful skin! PaloVia is a fantastic FDA approved laser treatment tool that you can purchase and use in the comfort of your own home whenever you have a few minutes. The results are well documented throughout many reviews and before/after pictures – and we must agree, it really seems to work wonders! PaloVia’s current retail value is $499.00. Exfoliation is one of the best things a woman can do for her skin. It can provide a clean, flawless look as new skin cells are regenerated and the old skin cells are removed. It’s magical, really. By use of Aluminum-oxide crystals found in many microdermabrasion methods utilized in your Dermatologist’s office, you will renew and regenerate your skin to levels you have never before seen. The PMD Microdermabrasion System is valued at $179.00. Light therapy has become increasingly popular for many skin conditions. Though many at home light therapy tools have claimed to treat and even heal a myriad of skin conditions, their claims tend to fall short and money is generally wasted. The Baby Quasar Plus Basic is a phenomenal tool that actually works for results you can see and feel. Acne is diminished and aging is prevented through use of this special light therapy tool. Retail value is $399.00 and worth every penny. This device is as handy as they come. For any woman looking to fight pre-mature aging, you may want to invest in one of these incredibly clever gadgets to add to your beauty and skin care regimen. By use of microcurrents pulsating through your skin, the aging process is halted and prevented. It’s rather a fabulous piece of equipment, in our opinion! The NuFace Trinity Facial Toning Device retails at $325.00. With so many high tech, high end beauty gadgets on the market, it’s difficult to choose only a small few to tell our readers about. We hope you will look into the products we have reviewed, and let us know your own thoughts or concerns. Have you had personal experience with one of these products? Let us know in a comment. Modern day luxury cars have really become very plush. Today, automakers really need to make that extra bit of effort in order to ensure that their highly priced products actually look special enough to attract the public interest. It is no longer enough to have the right number of cup holders. People now need motorized cup holders or complete champagne coolers. It is no longer enough to offer LED headlights. People are now looking for curve sensitive headlights and starlight headliners. When it comes to the interiors, automakers must really top themselves to offer customers with a level of opulence not seen before to become really popular. Continuing on with the OROGOLD theme of “luxury leisure”, OROGOLD Cosmetics examines some of the top luxury cars in the world today. The Audi S8 4.0T offers a 4.0L 520 horsepower engine, SIDEGUARD curtain 1st and 2nd row overhead airbags, 4 wheel anti-lock brakes, 8 speed automatic transmission along with overdrive, integrated navigation systems, rear side-impact airbags, automatic air conditioning, side seat mounted airbags, driveline traction control, 21” aluminum wheels and cruise control. The 2014 Aston Martin Rapide S is a 4 seat sedan that is available at a base price of almost $198250. The vehicle comes equipped with a 6.0L 12 cylinder engine that offers 19mpg for highway driving and 13mpg for city driving. Automatic transmission is also offered as a standard feature. One of the most basic features of the 2014 Jaguar F-Type is the 3.0L 380 horsepower intercooled supercharger engine. Other popular features offered include 4-wheel anti-lock brakes, automatic air conditioning, driver and passenger side airbag head extensions, integrated navigation systems, side seat mounted airbags, 19” aluminum wheels, airbag occupancy sensor and cruise control. The 2014 BMW 328 comes with a 2.0L 240 horsepower intercooled turbo engine, 4 wheel anti-lock brakes, 8 speed automatic transmission with overdrive, electronic stability, cruise control, 17” aluminum wheels, airbag occupancy sensors, driver and passenger knee airbags, 1st and 2nd row overhead airbags and driveline traction control. The 2014 Lexus IS 250 is famous for standard features like the 2.5L 204 horsepower engine, 4 wheel anti-lock brakes, 6 speed automatic transmissions with overdrive, airbag occupancy sensors, 17” aluminum wheels, automatic air conditioning, driveline traction control, side seat mounted airbags, electronic stability and 1st and 2nd row overhead airbags. The 2014 Audi A7 comes with a 3.0L 240 horsepower intercooled turbo engine, 4 wheel anti-lock brakes, 8-speed automatic transmission with overdrive, SIDEGUARD curtain 1st and 2nd row overhead airbags, driveline traction control, cruise control, 19” aluminum wheels, automatic air conditioning, driver and passenger knee airbags, airbag occupancy sensor and side seat mounted airbags. 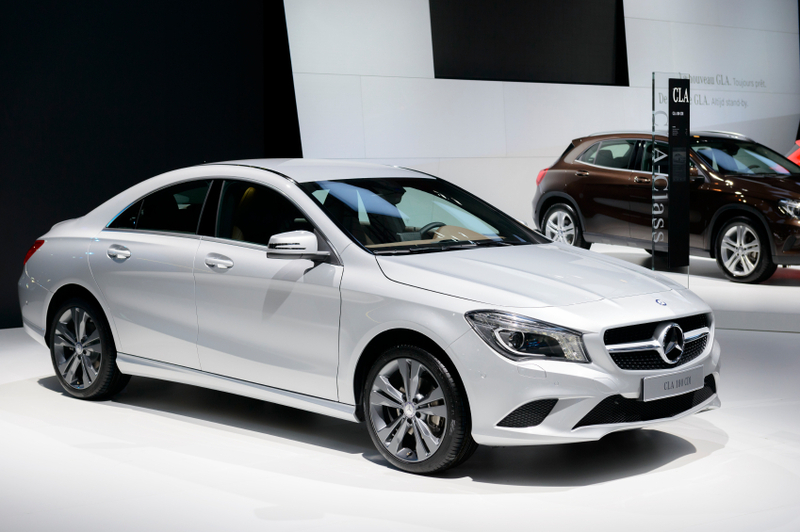 The 2014 Mercedes-Benz CLA Class comes with a 2.0L 208 horsepower intercooled turbo engine, 4 wheel anti-lock brakes, 7 speed auto-shift manual transmissions with overdrive, driveline traction control, 17” aluminum wheels, cruise control, driver and passenger knee bags, BabySmart airbag childseat sensor, airbag occupancy sensor, ABS and electronic stability.